Apple's global lead in selling premium smartphones is particularly evident in new metrics that show the company's iPhone 5c and 5s represent 42 percent of global 4G LTE smartphones. New data from Counterpoint Research for Q1 2014 shows Apple has maintained more than 40 percent share of LTE shipments over the past year despite dramatic 91 percent year-over-year growth in LTE shipments, which now contribute more than a fourth of all smartphones shipped worldwide. Apple's lead remains so large that its iPhone 5c and 5s sales outsell all of the various LTE phones sold by Samsung by a wide margin. Apple's two LTE iPhone models also outsell the rest of the industry's total shipments of all LTE phones sold globally by LG, Sony, Motorola, Nokia, HTC, ZTE, Huawei, Sharp, Kyocera, Pantech, Coolpad, Fujitsu, BlackBerry, Lenovo and all others tracked by the firm. Despite a "narrow portfolio" of LTE devices, and the fact that Apple only began making LTE-savvy phones starting with iPhone 5 in 2012, at least two years after a variety of Android licensees rushed first generation LTE products to market, Apple now dominates LTE sales. 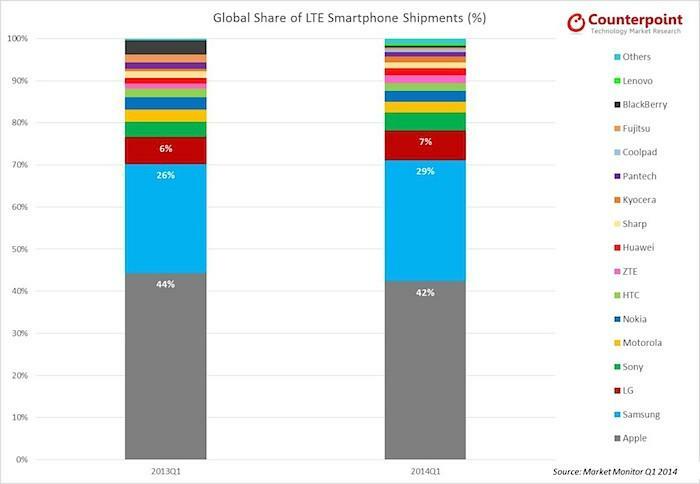 Counterpoint notes that the U.S. currently accounts for one in three LTE phones, with Japan in second place and China in third, ahead of South Korea. China is expected to overtake Japan by the end of 2014 to become the world's second largest deployment of LTE handsets. After having swooped up key market share among premium LTE handsets in the U.S. and Japan, Apple is now reported to have taken 58.7 percent of China Mobile's newly emerging, homegrown TD-LTE market, despite the widespread popularity of large screened phones in Asia.